Post your videos from the HelloClan server here. I posted this video some years ago on this forum, but here it is again: it's a showcase of the old server (2011-2012). Found this one while looking trough my uploads, not sure where it was recorded, but it was on the HelloMiners server. I was not sure if I wanted to post this, took some considering from my side as this was back from when I only just started to use a microphone (which was a struggle for me in a long time), so I am very insecure when speaking But it must be some one of the oldest surviving videos of the HelloMiners server. 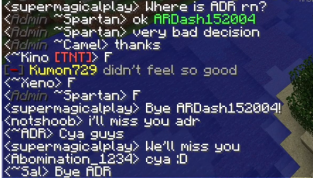 This was recorded only a few days after the server started (back when factions was a thing). Notice how few structures that was in HelloClan City compared to now, it's really amazing how big it has become Might contain a wild Prevoo. oof, I'm gonna be in that education boat soon... I better put in time while I can. That dance is a master peice. The nostalgia in all the videos! In the showcase, it showed some of the first people to really play, I also noticed Deadly_Hippo commented in one of your more recent videos, he was on the baltop. All the locations in the other ones I remember visiting and seeing in my early days of 2015. Thanks for sharing this, I've subscribed and I've started watching some of your other work.